Be the first to share your favorite memory, photo or story of Pearl . This memorial page is dedicated for family, friends and future generations to celebrate the life of their loved one. Pearl May (Petefish) Cooper, age 91 of Carthage, passed away on Sunday, November 25, 2018 at Sarcoxie Nursing Home. She was born on March 22, 1927 in Zineville, Oklahoma. Her parents were Cecil Petefish and Inez (Seybold) Petefish. Pearl retired from ASCS, Carthage. She attended Joplin Jr. College. 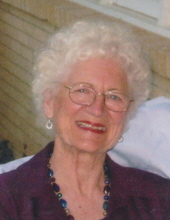 Pearl was a member of Alba Friends Church. Pearl and Cecil were married September 7, 1946 in Columbus, Kansas, and he preceded her in death on February 25, 2003. She is survived by one brother, Cecil Petefish of Springfield; a daughter, Deborah Davis and husband Bryant of Joplin; a son, Steven L. Cooper and wife Janette of Carthage; grandchildren, Matt Jewell and wife Amy of Florida, Kyle Davis and wife Aimee of Tennessee, Beth Morgan and husband Randy, Lynn Cooper and wife Debra, Zach Holden, Pam Miller and husband Ben, and Dustin Kisling all of Carthage. She had 14 great grandchildren and 6 great great grandchildren. Pearl was also preceded in death by her parents, a sister-in-law, Shirley Petefish; and a granddaughter Sara Holden. The family will be present for visitation on Friday, November 30, 2018 from 1:00 PM until service time at the funeral home. Funeral services will be held on Friday at 2:00 PM in the chapel of Simpson Funeral Home in Webb City. Burial will follow at Friends Cemetery in Purcell. In lieu of flowers the family suggests memorial contributions in her memory to the Sarcoxie Nursing Center, 1505 Miner Street, Sarcoxie, Mo 64862. Services are under the direction of Simpson Funeral Home in Webb City. Visit www.simpsonfh.com for online condolences. To send flowers or a remembrance gift to the family of Pearl May Cooper, please visit our Tribute Store. "Email Address" would like to share the life celebration of Pearl May Cooper. Click on the "link" to go to share a favorite memory or leave a condolence message for the family.